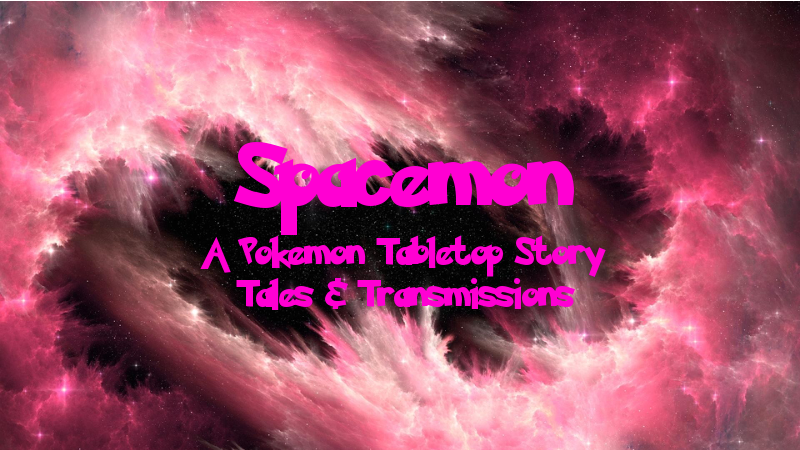 Welcome to a romantic Valentine’s Day installment of Spacemon, the tale of a Pokemon TRPG campaign! This is the first of hopefully many loosely related one-off stories set between the events of the two main Spacemon campaigns. You can get caught up on the original adventure here! Alex awoke in a happy mood, glad the day had finally come. For most people, it was just another Friday— which in and of itself was a bit special, being the last day before the weekend— but for Alex, it meant something more. She had been waiting for this day with anticipation for weeks and now it was finally here. As her eyes slowly fluttered open, Alex felt the warmth of Naomi’s body pressed against her back, her arms wrapped around her, her slow, steady breaths tickling the back of her neck, and a smile formed on her face. This was the way life was supposed to be. This was what she wanted to wake up to every morning. Alex spent several moments watching the shadows of the passing skylane traffic slide along the wall, just enjoying the comfort of her girlfriend’s embrace, but eventually, she decided it was time to get up. There was a lot she needed to accomplish today, and she only had a very limited amount of time to get it all done as she had a very special plan for the evening. Naomi’s arm fell away onto the mattress as Alex sat up and slid herself to the edge of the bed. Alex dangled her legs over the side of the bed, then stretched out. As she moved to stand up, Alex felt Naomi’s hand grab her by the wrist. She turned to see her girlfriend looking at her with an impish smile on her face. “Hey, where do you think you’re going?” Naomi asked playfully, tugging on Alex’s arm. “Alright, fine, but tonight you’re all mine.” After a kiss on the cheek, Naomi released her grip, allowing Alex to stand. And with that, Alex headed into the bathroom to start getting ready. Normally, Alex just hung around the house in something comfortable while she filed paperwork and reviewed the projects she was overseeing in her branch of the Institute or worked on her latest Pokeball designs, but on days where she needed to make conference calls with her colleagues, she actually needed to look presentable. After living on the streets for so long, she still wasn’t quite used to the notion, but over the past few years she had been adapting quite well thanks to Naomi and her far more superior fashion sense. Once she was all ready, Alex was able to share a quick breakfast with Naomi before she needed to leave for the university. She was quite fond of these such moments, these small little bits of everyday life they shared together. It brought back memories of their time together on Vandia when she first fell in love with Naomi, and today, more so than most days, that period of her life was on her mind. Back then she had dreamed of the life they might have together, and now here they were, living it out just like she pictured. Today, Alex wanted to celebrate the years since then because she was ready for so many more. “I can’t wait,” Alex said, beaming with excitement. Of course, she had much more than cuddling planned for the day, but that was going to be a surprise. Tucked away in a beautiful green corner of Avalon’s capital city, the students of the University of Avalon enjoyed both the benefits of city life and the peace and tranquility of nature. Alex stood near the middle of the suspended garden platform connecting the university’s four towers, watching the the bustling masses of students traveling between classes and playing with Pokemon in the grassy circle in the center. Although she had visited Naomi here many times, it always filled the Sinai girl with wonder. Back on Vandia there was never any manmade structure quite like this. It still amazed her that this quad, which was home to several large trees, was held up between the towers so far above the planet’s surface. She loved visiting when she had the time, and today her visit was extra special. After her conference call with her colleagues at the Institute— a call that had gone quite well despite her lack of understanding of a lot of the science, not that she particularly minded as she had a good eye for what sort of research was and was not ethical or worth looking into— Alex had somehow found the time to get through her entire to-do list in the few remaining hours she had before Naomi got out of class. She had groomed all her Pokemon and took them out for their daily dose of exercise, she had reviewed all the status updates from her department for the week, and she had even found the time to pick up her meds. On the way to the university, Alex made one last stop. She picked up a bouquet of beautiful roses at the florist to give to her lover. She knew Naomi would love them. With only a few minutes left until her girlfriend got out of class, Alex made her way inside the north tower and rode the elevator up. She made it to the correct classroom just in time to see the students begin filing out. I hope I didn’t miss her, Alex thought once the flow of people began to trail off. She was starting to feel a bit anxious that her plan had somehow gone wrong before she finally spotted Naomi’s impossible to miss bright purple hair. She was the last one out, emerging next to the professor, chatting away. Just like her. Alex quickly hid the flowers behind her back as she approached. And with that, she ran over to Alex. “What are you doing here, babe?” she asked before leaning in for a kiss. “Oh, it was nothing really.” Alex felt herself blushing. By this point Alex was giggling almost uncontrollably. She had been teasing Naomi the whole way home about what she had planned for them this evening. Of course, she was planning on telling her eventually, but right now she was having too much fun. “Pleeeeeease?” Naomi begged as they walked together down the hall to their apartment. “Alright, alright,” Alex finally said, stopping just outside their door. She playfully pushed her girlfriend against the wall as she was reaching to open the door. “You and I are gonna go see that new Galactic Vanguards movie and then I’m gonna take you on the best dinner date you’ve ever had.” She stood up on her toes and gave Naomi a big kiss. “It’s only because I love you so much,” Alex said as they entered the apartment. “You’re the best, babe. Now, c’mon. We gotta get ready. Since you picked the movie, I get to pick what you wear tonight.” With that, Naomi dragged Alex into the bedroom. The next hour was spent rummaging through the closet. Naomi had settled on her own outfit rather quickly, opting to wear her favorite black dress, but she was certainly taking her time with choosing Alex’s. Alex knew better than to say anything, and besides, she loved wearing nice things for Naomi. Alex stood in the bathroom looking at herself in the mirror, wearing little more than a pair of slacks and her undergarments, her tattoos on full display. There was the Helix shell on the back of her right shoulder, the stitched-up heart just below her collarbone, and, of course, the full sleeve tribute to Leviathan on her left arm. Her other arm was home to two new additions. An image of Ebony under a full moon now adorned her upper arm. She got it the previous year to celebrate fifteen years of friendship with her very first Pokemon. Beneath that was her very first tattoo— her mantra for life— except now it was framed by a design of interlaced roses, wrapping around her entire forearm. Alex was proud of her collection. “Hey, babe, can you zip me up?” Naomi asked as she walked into the room. “Sure thing.” Alex turned from the mirror and grabbed the zipper on the back of her girlfriend’s dress. “You look so beautiful,” she said as she slid it up Naomi’s back. Naomi grabbed Alex by the hand and dragged her back into the bedroom. The two quickly finished getting ready, and then they were off. Alex was giddy with excitement, not just for the next installment in her favorite film series, but for the dinner, for the rest of her plan for this special day. “Man, you are such a dork,” Naomi laughed. One bus ride later, the pair found themselves down by the waterfront where all the nice restaraunts were. Neither would normally spend so much on any of the expensive places here, but tonight was a special exception. Alex lead Naomi to the place she had selected, and they were in turn led to their table. Once they finally settled on what they were going to eat, the two lovebirds continued to discuss the movie, and when they had thoroughly analyzed it, they finally moved on. Alex was content to sit there and just listen to Naomi talk about school and the latest goings on at the university. She loved listening to her voice; it was so soothing. Even when the food came, Alex continued to listen, hanging onto her every word. She knew that this was what true love felt like. I will spend the rest of my life with her, she thought. Tonight everyone will know. “Sorry, what?” Alex asked. She hadn’t realized that she had become so absorbed in thinking of what she was about to do. Once they paid for their meal, Alex and Naomi stepped outside into the light of the setting sun. Alex was giddy with anticipation once more as she led her girlfriend down to the waterfront. The low sun cast beautiful reflections across the shimmering water of Avalon’s ocean. Alex barely had time to stand before Naomi swept her off her feet. Alex wrapped her legs around Naomi as she lifted her onto the railing. As the sun sank below the horizon, the two girls were locked into a passionate embrace as the next chapter of their lives began. Author’s Notes: Look at me starting another Spacemon project! With a sequel campaign now underway, the fifty years after the original that precede it are ripe for storytelling. Tales & Transmissions will be a collection of short stories set in that time period that I will be releasing from time to time, starting with this Valentine’s Day special. I actually planned this piece last year but didn’t get around to posting for Valentine’s Day because I had literally just finished writing the last chapter of the original campaign. Alex and Naomi have certainly become one of my favorite couples in fiction, so I knew they were perfect for a Valentine’s Day special. There’s not too much to say about this one since I think it speaks for itself. There’s a few subtle details and allusions to other bits and pieces of the post-campaign setting that have yet to be explored, but I won’t delve into those here. I did do a few callbacks to the third part of Alex’s origin story with them going to see the next Galactic Vanguards and then going to dinner. Obviously, Guardians of the Galaxy, Vol. 2 isn’t out yet so I couldn’t really reference it, but it was still a fun little bit to explore. I’ll leave this short and sweet, so happy Valentine’s Day everyone and thanks for your continued support of Spacemon! That does it for this story. As always the Spacemon gang and I will be monitoring the comments to foster discussion and answer any questions. Feel free to give feedback and critiques of the writing so I can improve it for the future, or just leave a comment with what you think about what went down in this piece! You can also revisit past chapters, check out the rest of the Spacemon saga, join the Spacemon Discord server, or like our Facebook page to stay updated on all things Spacemon! Click here for the next exciting installment of Spacemon!